Achievements - A noted scientist of India, Dr Shanti Swaroop Bhatnagar was appointed the first director-general of the prestigious Council of Scientific and Industrial Research. He also hold the credit of building 12 national laboratories like Central Food Processing Technological Institute at Mysore, National Chemical Laboratory at Pune and so on. 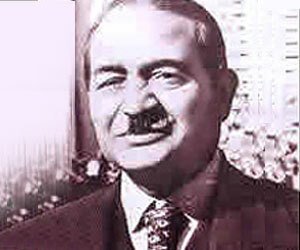 Dr Shanti Swaroop Bhatnagar was a distinguished Indian scientist. He was born on 21 February 1894 at Shahpur, which is located in Pakistan in present times. His father passed away sometime after the birth of Shanti Swarup Bhatnagar. As such, he spent his childhood days with his maternal grandfather who was an engineer and it was here that he developed an interest in science and engineering. Read on this biography to know more about the life and professional history of Dr Shanti Swaroop Bhatnagar. As a child, Bhatnagar loved to construct mechanical toys. In the home of his maternal family, he also developed an interest in writing poetry and his one act play in Urdu 'Karamati' won the first prize in a competition. After completing his master's in India, Shanti Swaroop Bhatnagar headed to England for a research fellowship. Here he got his D. Sc degree from the London University in the year 1921. When he came back to his native country, Bhatnagar was presented with a proposal of professorship at the renowned Benaras Hindu University. Dr Bhatnagar was knighted by the British Government in the year 1941 as an award for his research in science, whereas, on 18 March 1943 he was selected as fellow of the Royal Society. Though his area of interest included emulsions, colloids, and industrial chemistry, but his primary contributions were in the spheres of magneto-chemistry. He also made a melodious kulgeet i.e. University song, which is still sung with great pride before any function in his university. Prime Minister Jawaharlal Nehru himself was an advocate of scientific development. After India gained freedom from British rule in 1947, the Council of Scientific and Industrial Research was established under the chairmanship of Dr. Bhatnagar, who was appointed its first director-general. In the coming years, he set up 12 national laboratories like Central Food Processing Technological Institute at Mysore, National Chemical Laboratory at Pune, the National Metallurgical Laboratory at Jamshedpur and many others.